Like so many other runners Chris Solinsky was first a “soccer nut” and wanted nothing to do with running. Even with consistent prodding from his parents, both good runners in high school, it was always about the soccer field. But eventually, maybe to quiet them, he gave up his soccer cleats for the season and ran cross country in 8th grade. He describes himself then as a “middle of the pack” runner. The relationship between how he improved and how that helped the team got him hooked on cross country. When he became more successful the team became more successful. He really liked that. To make things even more exciting when he worked harder and took running seriously he got better…a lot better. He liked that too. By the time Chris was a sophomore he was virtually unstoppable. Running for Stevens Point Area Senior High School in Stevens Point, WI Chris won the Wisconsin State Cross Country Championship 3-times in a row. In the spring of his sophomore year he won the state championship in the 3200 meter run which began another streak of three titles. Add in the 1600 state championship his junior and senior years and he was 8-time state champion. At the 2002 National Foot Locker Cross Country Championships he won by 21 seconds. That was the largest margin of victory by any male ever at the FLCCC eclipsing Dathan Ritzenhein’s (Aim High ’11) previous record by one second. He finished his high school career with personal bests of 4:03.80 for 1600 meters and 8:43.24 in the 3200. With such a successful high school career one would think every D1 college in the country would be recruiting him, but they didn’t. That’s because most all coaches assumed it was a foregone conclusion he would attend Wisconsin. Maybe they were right not to waste their time because when Chris visited Wisconsin he really liked the coach, Jerry Schumacher, and his training philosophy. A Badger he became. By the time he graduated from Wisconsin he was a 5-time NCAA champion including indoor 3000 (’05 & ’06), indoor 5000 (’07) and outdoor 5000 (’06 & ’07). He led the Badgers to the 2005 NCAA Cross Country and 2007 NCAA Outdoor Track Championship. Chris graduated from Wisconsin in December of 2007 with a Bachelor of Arts degree in history and sociology. Fast forward to December of 2009. He marries his sweetheart, Wisconsin pole vaulter Amy Dahlin. Then it’s off to Portland full-time to train with the Oregon Track Club under the watchful eye, once again, of Jerry Schumacher who had resigned his position at Wisconsin to coach elite athletes running for the OTC. 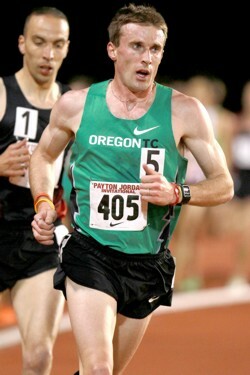 In 2010 Chris ran 26:59.60 in the 10,000 to set the then American record and broke 13:00 minutes for 5,000 meters three times. It’s a feat unmatched by any other American distance runner in history and an accomplishment only achieved by the very best runners in the world. There are many questions one could have for Chris Solinsky. How did he accomplish what he has? How does he deal with injury? What are his future goals? You can ask Chris these questions and more….at Aim High!